The debate has commenced within the communities around the Dickson Parklands, previously referred to Section 72 Dickson, as to how the whole site could become a parklands with an integrated set of community cultural facilities that connect to the surrounding communities. At present this site has a mixture of uses, some under utilised areas as well as a very valuable open space in the centre. The site, while zoned for community uses, suffers from not having any agency to oversee the delivery of a workable mix of community cultural facilities. The site has suffered over the years because it seems that some zoning allowances have been twisted to allow for some uses of the site under the guise of being community oriented. The whole site has a generous amount of trees and shrubs. However, because of the lack of focus, the site suffers in profile and is not well-connected into the surrounding communities. The site is situated to the east of the Dickson Pool, and is bound to the north by Antill Street and to the south by the Dickson Linear Park, which in itself is dominated by the Dickson Drain. I have previously posted on the government’s most recent move to convince the communities to have residential units built on the site – click here – as well as on the dangers of this move to the future of the site as a community asset – click here. Despite an aura that Canberra communities have benefitted from very generous facilities, in the arena of community cultural facilities, this is not quite so. For example while Gorman House is a central community cultural facility, it was not planned as such. It is a clever re-use of a housing site thanks to some timely lobbying at the time. Tuggeranong Community Arts was not planned for but was the result of very strong and determined advocacy from the arts and community groups. I am unaware that a similar facility is planned for Gungahlin, and I suspect one will be argued for one day by local communities and arts groups. The Belconnen Arts Centre is a recent addition to a long-established city centre; I doubt that it was on the original planning for the area. Here in the inner North, the closest we have had is the services offered through the North side Community Centre as well as the ad hoc services provided by various groups such as those that have been very active through the Downer community Centre. We have ANCA (Australian Capital National Artists), and that was years of lobbying to get these facilities. The now vacant site which was previously the Downer Club (burnt down) – this could be a future Aged Peoples’ Home. Salvation Army Facility – the future of this is unknown – but it could be a wonderful cafe and other facilities. A Union Complex, Training Centre and a Lawyers Office and a Superannuation Office. This part of the site should be handed back for true community cultural uses. A New Building – apparently for a dance studio. The Tennis Courts – to stay. The Dickson Linear Parkland – which at the moment is dominated by the Dickson Drain, which is to go! – all or at least part of it to be redesigned as a waterway – wetland. The site has just the one formal road entrance, a number of very informal pedestrian entrances, limited parking and is seen to be physical isolated because of the drain (south) and the busy traffic along Antill (north) and Cowper (west) Streets. As the parklands site is close to the shops, some lobbyists would consider it natural that any vacant or unused part of the site should be best used by having apartments built. This would allow people to live close to the main amenities of the commercial centre. Of course this is correct and logical. But. There are already numerous plans in the pipeline for a host of new residential apartments throughout the central areas of the Dickson Group Centre. All of these, plus the new developments along Northbourne Ave, plus all the new infill developments in the surrounding suburbs, will be increasing the population of the area significantly. Over the next decade there is likely to be an abundance of opportunities to live in and to be very close to the Dickson Group Centre. There is absolutely no requirement to diminish the amount of community spaces (potential and present) to meet any demands for residential opportunities close to the Dickson Group Centre. In fact with this forecasted marked increase in residents, the need for more cultural and community facilities as could be made available through the Dickson Parklands becomes even more of an imperative. Another key issue is connectivity. This issue relates to the site being surrounded on two sides by major streets. This is a real factor. No matter what happens on the site, the traffic and parking issues will need to be addressed. One concept is to slow down all traffic in and around the Group Centre. It is suggested that traffic along Antill near the Parklands and the Group Centre could be slowed to 40 kph. This would make the whole area more friendly to all who pass through and who use the centre and the Parklands. The pedestrian crossings need to be investigated and improved. The walkways through the Parklands need to be constructed to encourage easy access. Possibly some new parking could be introduced on the side of the playing fields closest to the Parklands. And finally, with the much talked about improvements along the Dickson Linear Park (Dickson Drain), all forms of improved connectivity could be incorporated to link the Parklands to the walking paths along the Dickson Linear Park. 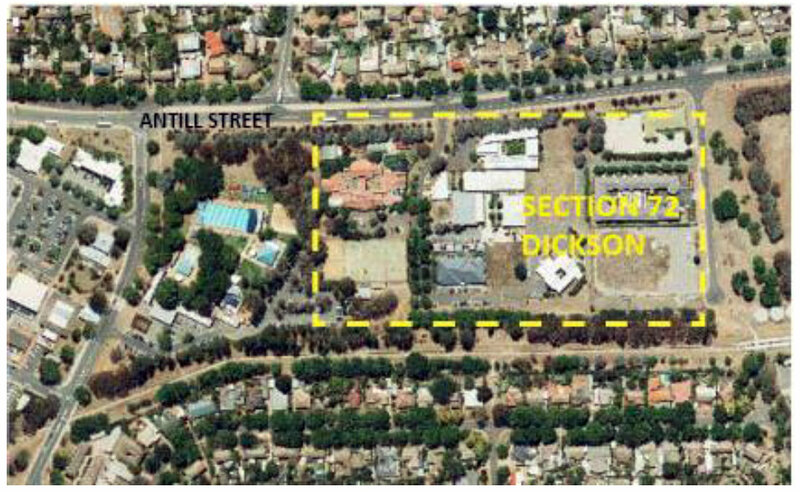 The proposal to be considered is that Section 72 Dickson is to be enhanced to become important community and cultural hub for the inner northern Canberra suburbs. Such a community and cultural site would enhance the opportunities for equitable access to and participation in arts and cultural activities. By having diversity, there is more chance that there would be participation and benefits fairly distributed across different socioeconomic and ethnic groups, age, gender etc. There is a mountain of evidence that demonstrates that having such central facilities has an impact on individual’s health and wellbeing, that they provide enrichment, for growth in creativity, and improve the opportunities for social inclusion as well as education. When such facilities are successful, the impact of the provision for arts and community activities opens up the sense of community, and has a huge contribution to the community’s sense of place. 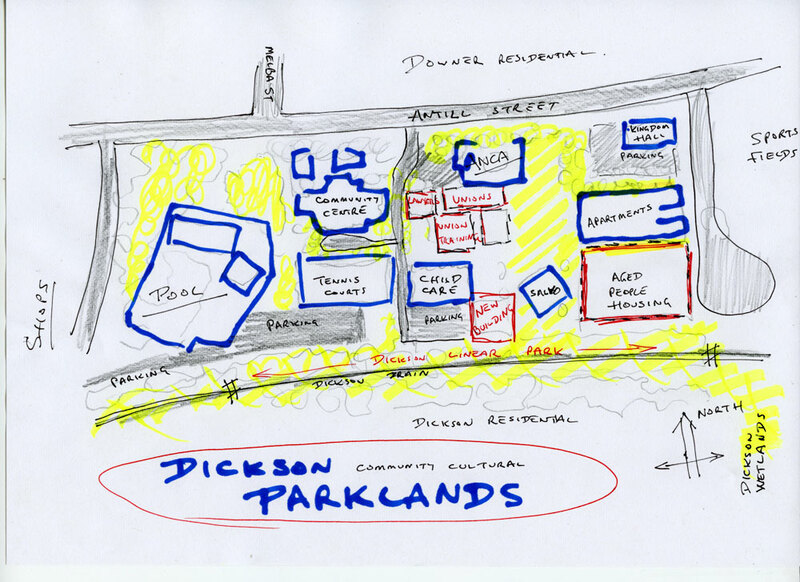 The site is to be titled as The Dickson Community Cultural Parklands to reflect the parkland nature of the whole site. The site is not to be called a ‘Cultural Centre’ as this hints that one of the organisations controls the whole site. The notion is that the Dickson Parklands is the site on which there will be a number of community and cultural functions. The case for enhanced community cultural facilities for the Dickson Precinct recognises that the area already has a number of successful services being provided. The Dickson Library would be the top of any list. 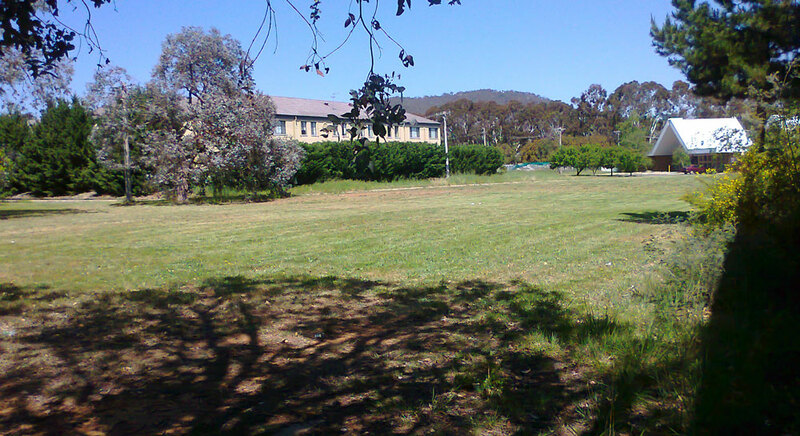 The North Canberra Community Centre has a long and successful history of providing social support as well as a range of cultural activities. The Parklands site has an artist-run gallery, artists’ studios, and a tennis court. There is a childcare centre. It is proposed that as part of the re-development of the whole site, that the government should look to building more buildings and specialist facilities for arts activities such as dedicated print, drawing and painting class rooms, along with facilities for associated exhibitions, and meetings rooms for literary and music groups – and more. It is the total of all the facilities, buildings and green spaces that forms The Dickson Community Cultural Parklands. The Dickson Parklands site is something that future generations of residents will be very thankful to the present generation of residents for having won the arguments to have this valuable community asset enhanced to be an attractive and functional community and cultural parklands. The dangers of these moves to the future of the site as a community asset – click here. Thanks Paul – thoroughly agree – and great to hear that the ACT Government has finally decided to act on the obvious opportunity to link the two new wetlands with a proper linear park (well, at least the first phase seems to be on the drawing board! ).